September 2016—13 the aerospace industry. In the past decade it has expanded the business to include much larger components such as housings and subassemblies. Today, Triumph Gear produces approximately 28,800 parts annually. 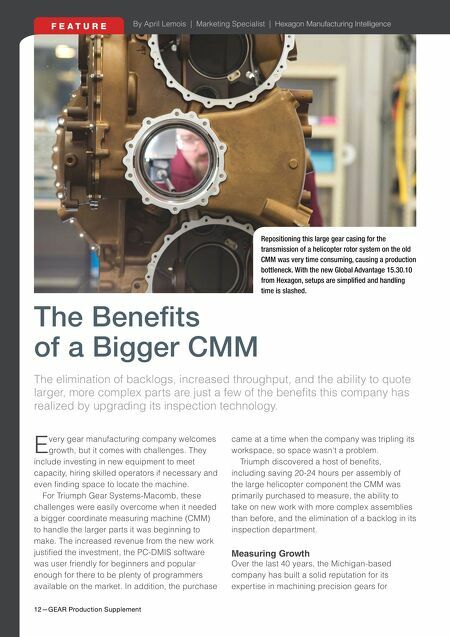 To facilitate recent growth, the company set about searching for a CMM that would meet all of its criteria, beginning with a much larger workspace and high-precision measurement capabilities for increasingly complex parts. The measurement solution also needed to be versatile so that it could verify a range of parts. While the existing CMM was capable of inspecting Triumph's newest component—a large gear casing for the transmission of a helicopter rotor system—it clearly needed more travel in the X-axis of the machine. Historically, to measure the part, the operator would lay it on one side, measure it, flip it 180 degrees about the Y axis, then measure the other side, causing a quality control bottleneck. In an attempt to speed things up, the inspection team began duplicating programs and part setup, actually causing further delays in output while their CNC machines sat idle. The solution came in the form of a Global Advantage 15.30.10 from Hexagon Manufacturing Intelligence of North Kingstown, Rhode Island. This advanced CMM package met Triumph's requirements for accuracy and speed, and it included features such as thermal compensation, advanced software and a high- performance analog scanning probe. This specific model has the highest-performing drives of the entire product line, with top acceleration to 4.3 meters per second squared, for maximum measuring throughput. Size Matters Robert Farr is the CMM manager at Triumph Gear. He points out that Triumph Gear's need for accuracy and repeatability is essential to its success, notably because several parts have tight tolerance requirements of 0.001 inch. The complexity of the housings the company manufactures calls for more precise alignments due to the size increase of the gears and axles involved. He says that, of the roughly 500 different part numbers the company currently produces, about one third require quality inspection. With less than 1 percent of parts returned to the metrology department, manufacturing intelligence is paving the way for precision manufacturing. "In order for us to maintain credibility with our customers, we need accuracy and repeatability. Efficiency is important, but not if it jeopardizes our quality," Mr. Farr says. "We are very confident in the accuracy of our programs and our overall ability to inspect parts." Once the machine was installed, he began modifying the company's existing program, reducing the handling time by roughly four hours per assembly. The helicopter gear casing no longer needed to be rotated, enabling faster setups, runtimes and change control times. The extra runtime also enabled the metrology department to keep up with internal demands. 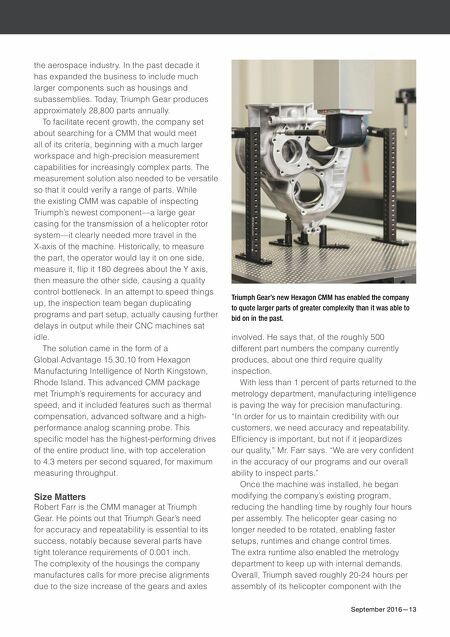 Overall, Triumph saved roughly 20-24 hours per assembly of its helicopter component with the Triumph Gear's new Hexagon CMM has enabled the company to quote larger parts of greater complexity than it was able to bid on in the past.